Guess what: it’s raining again, I don’t need a sun bed I have rust, and am a nice shade of ……well rust. BOULDER, Colo. — it took three rounds from a shotgun, five bullets from a handgun and two shots from a rifle to kill the 120-pound black bear that broke into a Boulder County home early Monday morning. The bear break-in was the fifth time in a week hungry bears have gotten into Boulder County residences, all while the residents were home. That has wildlife officials urging area residents to take precautions and bear proof their homes. Brenda Fischer's barking dog woke her at about 2 a.m. Monday morning. When she went upstairs to investigate, she found a bear in the kitchen of her home on Poorman Road, between Sunshine and Fourmile canyons. Fischer quickly returned downstairs to wake her two children and her husband. "As soon as I moved to try and make a place for him to get out, he charged me," Fischer continued. "That's when I shot him and he kept charging me. I shot him a second time, and he kept charging me. I shot him a third time and he was finally disoriented enough for me to get away." The first two rounds from the 12-gauge shotgun were birdshot and the third was rubber bullets, according to a report by the sheriff's office. The Fischers escaped through a bedroom window, leaving the wounded bear inside the house. When officers arrived on the scene at about 2:30 a.m., they found a bloody bear trying to claw his way through a screen door. Sheriff's Sgt. Lance Enholm, after determining that the bear was severely injured and would need to be put down, fired his .45-caliber handgun five more times at the animal. "(The first shot) struck the bear in the head, and it immediately reacted and began flopping around and growling," Enholm wrote in his report. "... I fired another round from my handgun, again striking the bear in the head. This didn't appear to have any impact on the bear, and it kept coming towards me." It was shot number nine, however, this time from the sergeant's .223-caliber rifle, that finally felled the bear; a final round ended the bear's suffering, according to the police report. And I get annoyed when a fly gets in. 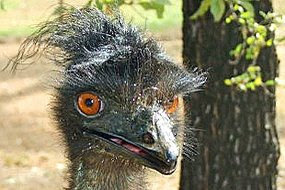 Seven-year-old Edward the emu, from Katherine, 300 kilometres south of Darwin, has been sitting on an empty nest and trying to round up his female owner, Patrena Arriston, whenever she comes close. "It's starting to get a bit frustrated and when I go in there to pet it or feed the chooks and stuff like that, I sort of get rounded up," Ms Arriston said last week. She appealed for anyone with a truck or trailer to help deliver a female emu, located 800 kilometres away, to Katherine to give Edward some much-needed company. Today, Ms Arriston said a trailer should be available for use by the weekend. And hopefully, so is Edward. Rothschild Village (Wisconsin) President Neal Torney says he's used to people misspelling his first name, but on Friday, such carelessness left him baffled. The state just erected a new sign on Interstate 39, and the only word spelled correctly on the giant, green billboard is "exit," a fact that has local officials and residents dumbfounded. "How do I politely say it shows some incompetence on someone's part?" 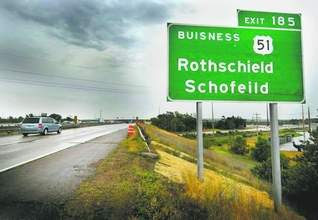 Torney said in between laughs over the sign, which reads "Exit 185 Buisness 51 Rothschield Schofeild." Greg Frank, general manager at Decker Supply Co. of Madison, the firm that manufactured the sign for the Wisconsin Department of Transportation , said the company takes full responsibility and will pay to make the I go before E in "Schofield" and make other fixes. Frank said the company is working to have the sign corrected today. The cost of removing and rearranging the lettering will be minimal, he said. He also promised to double check the work before hanging the repaired sign. I believe I have mentioned Tricky Dicky Branson’s problems with transport such as High altitude balloons and Atlantic crossing speedboats, now it seems that the Virgin Curse has spread to his airlines. The Boeing 737 was preparing for take off when a wheel fell off, nobody was hurt in Saturday's incident on a Sydney-bound plane which was taxiing towards the runway at Melbourne airport, the Australian Transport Safety Bureau said. "The axle between the two wheels has fractured and that's caused the right front wheel to separate," a bureau spokesman said. 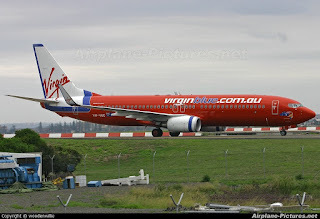 "I understand that as a precaution Virgin Blue has inspected their fleet." The Australian Licensed Aircraft Engineers Association said the incident, which is being probed by safety investigators, could have been catastrophic. "In this case, we were lucky that the failure occurred on the ground. The release of the wheel assembly in-flight could have seen a loss of aircraft," association secretary Steve Purvinashe said. "Unless action is taken, future incidences could be much more serious." They certainly could, you might have to eat the food. The new employee at Wookey Hole has taken up residence in her cave, 3124 Witches applied for the broomstick including 278 mothers in law and the lucky spellbinder is………..an estate agent, Carole Bohanan who will be known as Carla Calamity, the Witch of Wookey Hole. Miss Calamity, who admits to being several hundred years old — it would be impolite to ask how many — beat 300 other witches to the most coveted job in covendom. Miss Calamity, who wore sparkly stilettos and described herself as a “glamorous witch”, will now give up her job selling homes and instead greet visitors to the limestone cave complex. She said that the £50,000 a year pro rata salary was only appropriate for the best witch in the business. The contenders were whittled down from 300 to a final 15 who included a photographer, a dive master, an aromatherapist, a local journalist, a tattooist and a stonemason. The queue began to form at 5am. First to audition was Sharon Shaw, who calls herself a “hedge witch”. She was dressed in brown sacking, accessorised with a bleached rabbit skull and a piece of antler hanging from the metal belt around her generous waist. Another, forgetting that her role was to welcome young children to the caves, said she had been going for “the zombie septicaemia look, with a little bit of leprosy”. John Turner, another of the judges, was understandably nervous at the consequences of failing to pick the right candidate. He said: “One candidate is carrying around a bottle of her own urine. 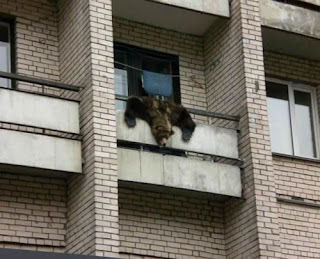 1) Listen, I know how that bear feels (ie me this morning after effing upstairs neighbours held high-decibel DVD show 'till c 0300h). 3) No, in the UK they'd get As (sorry, 'A's') & a huge fuss made of them + Oxbridge widely-castigated for being 'like, well-snotty, innit?' Why DO so many people in the UK apparently need to wipe their noses? Are we on the conty-nong being lied to about your swine 'flu figures? I think we should be told. 4) That lucky ... witch! I guess the sign guys never heard of the rule "i before e, except after c"? Great post! I found you through Pidelm! Thanks for the update about the Wookey Witch I had been following it at the beginning of the week but hadn't seen what the outcome was. Man .. Beautiful .. Superb .. I will bookmark your website and take the feeds alsoI'm satisfied to find numerous useful info here within the put up, we need develop more strategies in this regard, thanks for sharing. . . . . .